Angler Craig Wyness, from Peterhead, made what may prove to be the catch of the season, landing a Scottish Salmon weighed in at 30.5lb. The impressive catch was made on the Sheep’s Haugh Pool on Upper Netherdale beat on the Deveron, caught on a size 12 fly on Thursday 15th October 2015. The fish was returned to the river, but not before proud Craig posed for several impressive photographs for the family album. Angler Craig Wyness with his latest catch, assisted by Ghillie, David Low. The beat was let by Frank Henderson, owner of, Turriff Tackle & Trophies, Castle Street, Turriff. Mr Henderson is Trustee of the Deveron Bogie & Isla Rivers Trust. This fish will be entered for the Morison Trophy which is presented in memory of Mrs Tiny Morison who caught the heaviest salmon on fly in the UK at Mountblairy on the Deveron- weighing in at 61lb and this record still stands today. Turriff Tackle is one of the sponsors and provides a salmon fishing rod to the trophy winner. 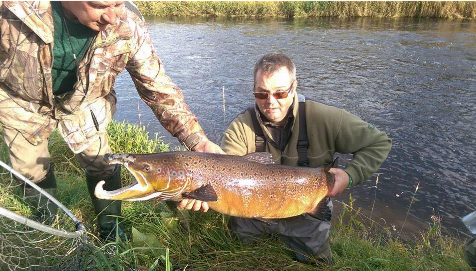 This is the third large fish Craig has landed on the Deveron and he previously won the Morison Trophy two years ago. This is a tremendous achievement by Craig as this season has again been poor for fish returning to the river. The Deveron has a ten year average catch of circa 3400 salmon but this has dipped over the last two years to 2500 and 1100 last season. Some explanations for this low catch rate may include the effects following the record breaking floods on the Deveron in 2009 and 2010 that caused the deaths of tens of thousands of young fish. A salmon’s life cycle is 5 years, two in the river and two at sea before returning and as far as river levels are concerned this year and last year have been drought years. The juvenile stock currently in the river is healthy as shown by electro fishing results carried out by the Deveron Bogie and Isla Rivers Trust every year. The hope is that next year should see more fish returning, whilst it is a comfort to know that we can still produce large fish. The Presentation of the Morison Trophy will be made at the Opening Day Ceremony on 11th February 2016 on the Turriff Angling Association beat on the Deveron at Turriff Bridge .